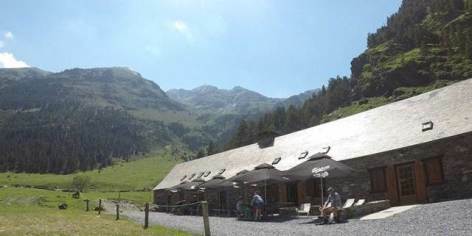 Easily accessible on foot or by car from the parking of Frédancon, the Hospice du Rioumajou welcomes you every day from June to September for lunch, but also in the evening for dinner on reservation (novelty). You can sit on the terrace, by the fireplace, or simply cool off. Children can even have their afternoon tea there. Come share one or more nights at the Hospice. Half-board starting from 45,00 €. 1 PMR room.